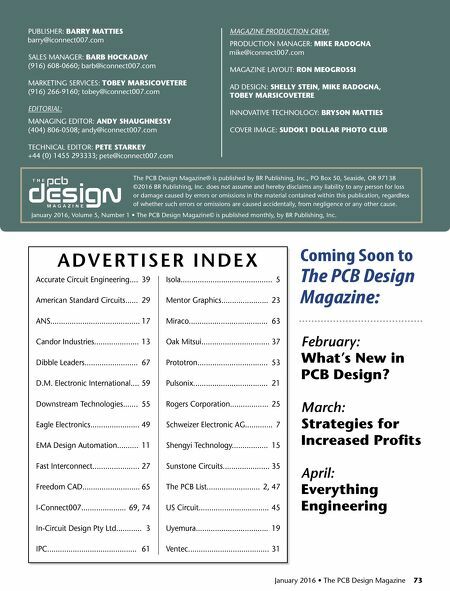 January 2016 • The PCB Design Magazine 73 Accurate Circuit engineering.... 39 American Standard Circuits...... 29 AnS.......................................... 17 Candor Industries..................... 13 Dibble leaders......................... 67 D.M. electronic International.... 59 Downstream Technologies....... 55 eagle electronics....................... 49 eMA Design Automation.......... 11 Fast Interconnect...................... 27 Freedom CAD........................... 65 I-Connect007..................... 69, 74 In-Circuit Design Pty ltd............ 3 IPC.......................................... 61 Isola........................................... 5 Mentor graphics...................... 23 Miraco..................................... 63 oak Mitsui................................ 37 Prototron................................. 53 Pulsonix................................... 21 rogers Corporation.................. 25 Schweizer electronic Ag............. 7 Shengyi Technology................. 15 Sunstone Circuits...................... 35 The PCB list......................... 2, 47 uS Circuit................................. 45 uyemura.................................. 19 Ventec...................................... 31 A d v e r t i s e r i n d e x PuBlISHer: BARRY MATTIES SAleS MAnAger: BARB HoCkADAY (916) 608-0660; MArKeTIng SerVICeS: ToBEY MARSICovETERE (916) 266-9160; tobey@iconnect007.com EDITORIAL: MAnAgIng eDITor: ANDY SHAugHNESSY (404) 806-0508; TeCHnICAl eDITor: PETE STARkEY +44 (0) 1455 293333; MAGAZINE PRODUCTION CREW: ProDuCTIon MAnAger: MIkE RADogNA MAgAzIne lAyouT: RoN MEogRoSSI AD DeSIgn: SHELLY STEIN, MIkE RADogNA, ToBEY MARSICovETERE InnoVATIVe TeCHnology: BRYSoN MATTIES CoVer IMAge: SuDok1 DoLLAR PHoTo CLuB Coming Soon to The PCB Design Magazine: February: What's New in PCB Design? march: Strategies for Increased Profits April: Everything Engineering The PCB Design Magazine® is published by Br Publishing, Inc., Po Box 50, Seaside, or 97138 ©2016 Br Publishing, Inc. does not assume and hereby disclaims any liability to any person for loss or damage caused by errors or omissions in the material contained within this publication, regardless of whether such errors or omissions are caused accidentally, from negligence or any other cause. 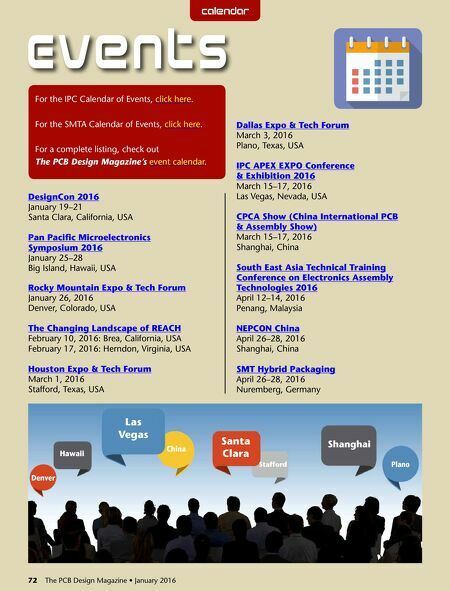 January 2016, Volume 5, number 1 • The PCB Design Magazine© is published monthly, by Br Publishing, Inc.